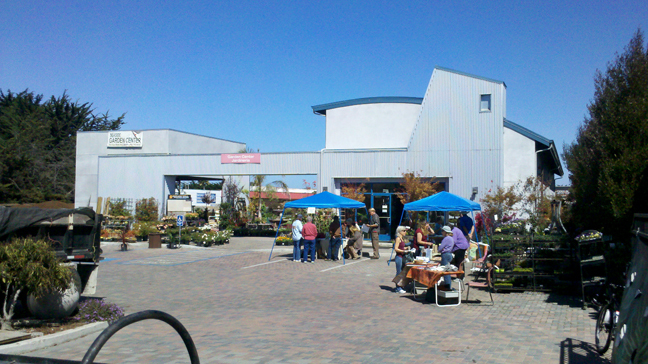 On Sunday September 9th, the California central coast city of Seaside held its third annual Sustainable Living Tour. Previous tours had focused on sustainably designed homes but this year the focus was more on DIY home improvements made by owners, showing that almost anyone can reduce their living costs and increase their contributions to improving the environment and local community. The self-guided tour began with registration at the Seaside Garden Center, which specializes in drought-resistant and native plants. The Garden Center also sells various composts and soils for planting as well as tools and equipment. This year the Garden Center also hosted a talk by Jimmy Rogers of Kellogg Garden Products, during which he discussed soil health and beneficial mycorrhiza. At the tour's first home, Tom Hughes and Cathy Rivera showcased a variety of sustainable projects throughout a large backyard – an array of vegetable gardens are pollinated by bees from the ten hives spaced around the property. These vegetable gardens are constructed from Hardieplank siding, whose product is strong, cost-effective, and eliminates some of the warping issues that wood can have. The vegetables are grown in mushroom compost, which is weed-resistant and free except for hauling costs from Salinas Mushroom Inc. or Global Mushrooms. Tomatoes are grown along the south facing wall to take advantage of seasonal sun in this mostly foggy climate. A 3,000 gallon catchment tank captures rainwater from the second floor gutters, and a storage system is under construction that will store up to 5,000 gallons. Almond and fruit trees are watered using greywater diverted from the laundry and bathtub using a branched drain system popularized by Art Ludwig. Home two featured a greenhouse and several catchment tanks, one of which is situated beneath a deck to save space. Walkways made from broken shipping pallets curve from the front yard into the gently sloping backyard and allow easy access to the many vegetable gardens. Recycled gallon milk jars are used as watering cans. The backyard was originally completely neglected and the present owner Marty Davis is currently about halfway through her planting and building process, covering the bare dirt with wood chippings and installing gopher-proof planter boxes. At the third home visitors were greeted with creations by a kindred spirit to our own Robin Wade: woodworking artist Michael Wildgoose creates custom furniture from salvaged wood and he also showed tour participants the homemade shed studio in his backyard. Michael found most of the materials for the shed and his pieces – benches, cabinets, doors and more – by exploring local salvage yards, Monterey Regional Waste Management District's Last Chance Mercantile, Habitat for Humanity's Re Store and Randattzo Enterprises. Since the shed studio is 120 square feet, Michael actually didn't need a permit to build it according to Seaside's building codes. However, it provides plenty of room for a small library, furniture and a work desk. The distinctive slanting cylindrical designs in Michael's furniture are either bamboo or tamarisk, a.k.a. salt cedar. 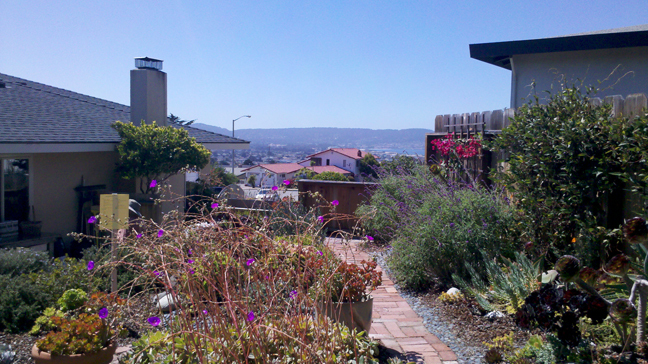 At the tour's fourth home, nestled atop one of Seaside's tallest hills, a tiered garden of succulents and drought-resistant plants frames a spectacular view of Monterey Bay. Louise and Peter Berry enlisted the help of landscape designer Helen Garcia to arrange their plantings, and they set up fruit trees and herb/vegetable gardens just outside their kitchen door. Small gazebos, shade structures and a fire pit made partly from recycled truck parts are spaced comfortably throughout the lush backyard, helping residents and visitors to sink into a relaxation almost immediately. A whimsical sun sculpture adorns a large homemade compost box. During the tour the owners made some of their many plants available for sale, with proceeds going to Sustainable Seaside. The fifth home showcased full-scale sustainable construction as well as gardening. Multitalented landscape and architectural designer Tracy Parker has completely renovated a dilapidated house to serve as her own home and studio. Outside, a rainwater flows under a reclaimed redwood deck into a permeable stone basin which feeds native plants and fruit trees. Inside, white walls and a high entryway with south-facing clerestory windows contribute to a welcome cooling effect during the hot summer months. Tracy also created much of the furniture inside and outside the house. She plans to implement a Rainwater HOG catchment system , an innovative modular design that can be stacked in compact spaces and even between joists or beams in buildings and can be used for thermal mass. At the tour's sixth home, Mary Pat O'Rourke and carpenter Don Basseri make extensive use of rainwater catchment. 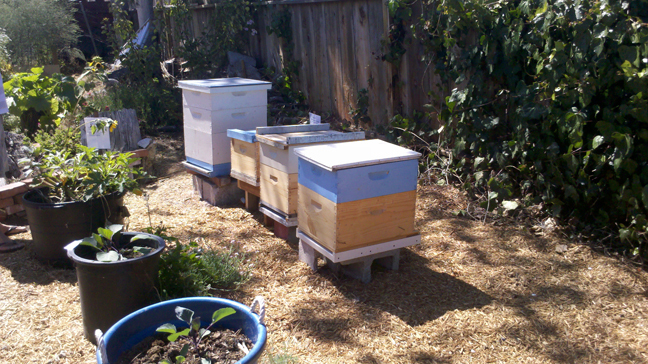 Two 1,500 gallon tanks serve the backyard and one in the front yard takes care of fruit trees. A network of pipes connects the three pipes to the roof, and a simple switch in the front yard allows control over the water's distribution. The backyard tanks are supported by a wooden enclosure which features two sculptural fountains. The fountains were found at local gardening stores, but the water they are fed with is all captured by the system. The tour's seventh and final home played host to several speakers throughout the day – I only caught the tail end of a talk on healthy eating but did manage to hear and see the home's owner, Susan Ragsdale-Cronin, give a demonstration of 'hot' vs. 'cold' composting – hot composting involves weekly turning, whereas cold composting is left alone – the cold method takes longer but provides richer fertilizer. Susan mentioned that a lot of coffee shops will give away their extra grounds, and placing cut-up potatoes in a top layer of compost is a good way to tell when the compost is ready; when the potatoes have grown, the compost is done. Susan then showed the tour participants around her extensive backyard, home to chickens and a wide variety of plants, many of which are 'volunteers' – a stray seed takes hold and she simply lets it grow. Many of the plants are fed with greywater from hand washing her dishes, and she pointed out that a clothes dryer can use more energy than a refrigerator so she dries clothes on the line. This year's tour provided a glimpse into some of the simple and cost-effective ways ordinary people can green their homes or even apartments, and next year I hope to revisit some of these homes and see how they progress!